SASKATCHEWAN: A NEW HISTORY is a deluxe commemorative publication for the provincial centennial in 2005. Award-winning Canadian historian and University of Saskatchewan professor Bill Waiser tells people stories against the larger backdrop of provincial events and issues since 1905. It is a celebration of what makes Saskatchewan special, as well as a critical look at the sources of the province's many challenges today. 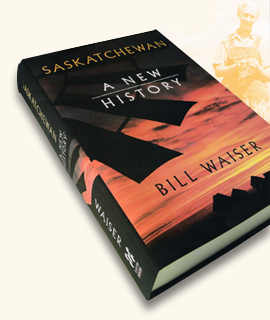 In SASKATCHEWAN: A NEW HISTORY Waiser offers new perspectives on traditional topics, base on the latest historical work in the area, and tackles previously neglected subjects. 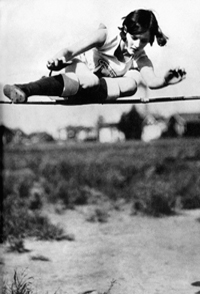 Specially selected historical and contemporary photographs throughout the book will complement the story. SASKATCHEWAN: A NEW HISTORY will provide an appreciation and understanding of why Saskatchewan history is different, if not unique, and do so in an engaging, accessible style. People will want to read this book and talk about it. A special advance copy of SASKATCHEWAN: A NEW HISTORY, was presented to Her Majesty Queen Elizabeth II during her visit to Saskatoon in commemoration of the province's centennial. The presentation took place at a special private ceremony, May 19th, 2005, and was also attended by His Royal Highness Prince Phillip, Lieutenant Governor Lynda Haverstock, University President Peter MacKinnon, former provincial finance minister and Professor Janice MacKinnon, University Chancellor Molloy and Alison Molloy, University Secretary Gordon Barnhart and Naomi Barnhart, and the author Bill Waiser and Marley Waiser. From the northern boreal to the gentle contours of the Cypress Hills, the fertile southern farmland to gracious urban living, Saskatchewan is a land of subtlety and contrast. Specially commissioned photographs by Saskatoon's John Perret capture the urban and natural splendour of Saskatchewan and its people and are featured in two 16-page colour inserts as a beautiful tribute to the province. A SPECIALIST IN WESTERN AND NORTHERN Canadian history, Bill Waiser joined the Department of History at the University of Saskatchewan in 1984. Bill is the author, co-author, or co-editor of eight books, including Park Prisoners: The Untold Story of Western Canada's National Parks and (with Blair Stonechild) Loyal till Death: Indians and the North-West Rebellion, which was a finalist for the 1997 Governor General's literary award for non-fiction. His most recent book, All Hell Can't Stop Us: The On-to-Ottawa Trek and Regina Riot, won the 2003 Saskatchewan Book Award for non-fiction. Between 1998 and 2001, Bill hosted a weekly history series, "Looking Back," on CBC Saskatchewan Television during the early evening news. It is also available in book format from Fifth House Publishers. Bill has served on the council of the Canadian Historical Association and the board of directors of Canada's National history Society, publisher of The Beaver magazine. He was named the university's Distinguished Researcher at the spring 2004 convocation. When not teaching or writing, Bill is a recreational runner and also likes to garden, hike, and canoe. Fifth House is a proudly Western-based press. Our publishing specialty is non-fiction as we believe that every community has a story to tell and is worth remembering. Fifth House is committed to "Bringing the West to the Rest" by publishing books that are selected for their quality and their contribution to the understanding of Western Canadian (and Canadian) history, culture and environment.